The Ontario Energy Board (OEB) has announced that electricity bills will be going up at least 2.4% a day from April 30-May 1st. Fortunately it's only twice a year the OEB sets the Regulated Price Plan (RPP) rates for retail consumers in Ontario, so the annual increase isn't over 700%, but it isn't 2.4 either. There's a couple of RPP plans; an old "tier" plan which charges less for the first tier of consumption, and the now more common time-of-use (TOU) scheme. Both RPP versions have rates set to average the the same amount; the calculations for that amount are communicated in a Regulated Price Plan Report. Rates are set to average $92.50/MWh (9.25 cents/kWh) as of May 1, 2014; last year rates moved to average $83.95/MWh on May 1st. The price for consumers is increasing by approximately $2.83 per month on the “Electricity” line, or about 2.4% on the total bill, for a household with a typical consumption pattern of 800 kWh per month. So, the average cost of a kWh is going up 4% that day. Other portions of ratepayers' bills have been rising too, at times more rapidly than the charge per unit of consumption. 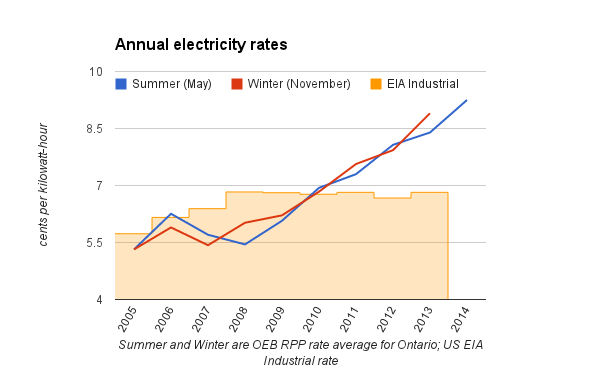 The rise in RPP rates has been a feature for over half a decade in Ontario. From 2008-2013 RPP rates increased an average of about 8.5% a year: US rates, over the same period, about 0%. The forecast for higher costs includes more generation in the next 12 months from sources including renewables. Let's dismiss the natural gas pricing story (again); the rate increase on May is tempered by a $1.87/MWh credit to clear the variance account built by recovering more than anticipated during the prior rate plan period. There's a neat story in how soaring gas prices didn't lead to higher than expected electricity increases, but it's not relevant to the current rate increases. The variance account figure is one variable in the equation used to establish the total cost the RPP should recover (CRPP in the equation - where H is the variance account amount). whatever deficit is in the variance account. This is not complicated at all: one variable increased, and it represents, "the amount paid to the OPA with respect to its payments under certain contracts with renewable generators." Perhaps "planning" is the wrong word. Ontario Power Generation (OPG) not only has a very significant rate increase application into the OEB, for July 1st, that rate increase indicates a directive to move a lot more hydro into the "prescribed"/regulated hydro. 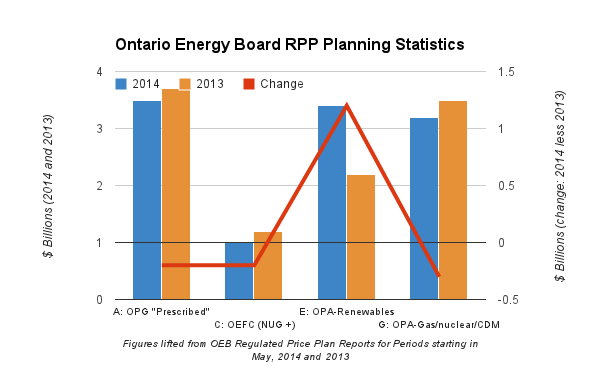 Were the OEB to allow an OPG rate increase it would be the first since the RPP rate inflation kicked in after 2008. OPG's prescribed rates have not changed in a period where US pricing remained flat and Ontario's RPP rates went up 48%. Stick OPG rate request ignored on a press release, along with notification the annual inflation for the portion of the bill being increased is over 10%, and that is due entirely to the contracting of renewable energy. 2. While the variance account does lower the RPP for the next rate period, it does not reduce it as much as the variance account reduced the RPP rates one year earlier. The hike due to renewable does look to be higher than 10%, but not significantly higher. 4. My previous post contained a table showing the combination of wind, solar and natural gas generation comprising 48% of the global adjustment. The OEB RPP report shows them adding to 49%. Must be a rounding thing.